You want to go out in the water, just float away to new places and see scenic beauties but just can’t seem to find the best kayak to do so. The spike in popularity that kayaking has seen it is not a surprise that more and more people want to try it out. The problem is kayaks can be expensive and if you don’t know which one to get, you could spend a lot of money on something that doesn’t balance or capsizes at first sight of trouble. That problem is a lot bigger when you start looking at all the options! There are just so many, and some are absolute crap. Specially if you plan to do kayaking for specific purposes, for which I will suggest you check out our other lists of best kayaks. Plan to relax in the water? You are looking for our recreational kayaks reviews. Now before we jump into our kayak reviews there is a small quick buying guide so you know what to look and expect for when buying one. If you already know about things like different types of hull and sit in vs sit on top, just jump to our kayak reviews or you can read our guide. If you have a high budget and want to get the best kayak over $1000, you should look at this one. The design may be expensive, but it is packed with convenience features and storage. The kayak is a two person sit on design and has a high weight capacity of 550 lbs. If you are spending this kind of money on a kayak, you are going to want to make sure that the design has everything that you want and need, which is something to keep in mind reading our review. If you are looking to get a kayak to go fishing or camping with, you will love the storage that this unit has in its design. Built in rod holders and four hatches to allow you to store all of your fishing tackle and gear and keep it dry. The design has plenty of on deck storage and lots of room for your feet to allow you to be able to sit in any position that you desire and throw your line into the water. The two person kayak will make it easy for you to be able to travel the water with speed and agility. The deck on this kayak is quite large and both passengers do get a large amount of foot room, ideal if you are a tall person. Both the bow and the stern have comfortable seats with back band, which will allow you to be able to be out on the water for as long as you desire. If you are looking to grab the best kayak under $1000, you should have a look at this design. This kayak offers a lot for under a $1000. You will find that there are a total of four color options to choose from, which is ideal if you have certain color tastes. The two person unit is pretty light weight, which makes it easy to carry around with you and makes it bearable to portage if you need to. This kayak is a two person SOT design. It is a total of 12.5 feet long, which helps you be able to get some pretty good speed when you are out on the water. One awesome thing about this kayak is that it is loaded with features and storage so that you can be prepared for anything that happens on the water. Thanks to this kayak being a two person design, you will find that your forward stroke when traveling with another person will greatly help to increase your speed. The kayak can handle open water and rapid conditions as it does have some pretty good stability on the water. So long as you have someone on the stern of the kayak that knows how to steer properly, you should have next to no issues with this unit unless you enter into some extreme water conditions. The design has a ton of storage and has waterproof compartments in it on deck, which are ideal for storing personal items like phones and wallets. The stern has a cargo area on this kayak and there are even tie downs if you have larger gear that you want to carry around with you. If you have a relatively high budget and are looking for a kayak under $800, you do have a lot of good options to pick from. This is certainly one of the many good options that you have available to you. The kayak is a C-1 SOT design and there are two different color options to choose from. It is designed with features that will help you to be able to remain comfortable out on the water for long periods of time, which is why this kayak made our list. There are a ton of comfort features that you are bound to like in the Scrambler. You will find a very comfortable four-way adjustable seat, which has some very good back support. The design has multiple foot wells, which allows you to be able to put your feet in any position you like, regardless of your height. These foot braces will allow you to be able to gain more power with each and every stroke. Another thing you will like is the molded side handles on this kayak, which helps greatly with your comfort and ease of transportation. Other than just comfort features, you will find that this kayak has a lot of things in its design that will help you with maneuverability and speed. It is long, but not so long that it makes moving with back strokes an issue. You will find the deck of this kayak to be quite easy to get off and on, which is always a good thing. Ekimo rolls are definitely possible with this design if you happen to capsize, which is always good for peace of mind. If storage is of great importance to you, you are also going to be a big fan. The kayak has a locked hatch that you can use to store gear and personal items that you want to keep dry. You will also find that there is a tank to hold bungee straps so that you can haul around larger items if you desire. With a location to hold your paddle as well as all the other storage in the design, you are not going to have to worry about being short of places to hold all of your gear. If you have a moderate budget and want to get the best kayak under $600, you may like this one seater. The kayak has a very nice back rest and a lot of storage areas that you can use to hold all of the gear that you need. The Skipjack has some very good maneuverability out on the water and you will love the fact that it is easy to get into the water and pretty easy to load onto a trailer or a vehicle to transport as well. If you are looking for storage the design has two different sealed hatches, which you can use to hold all of your kayaking gear. There is an additional bungee tie down area on the rear portion of the kayak, which you can use to hold some larger sized gear if you need to as well. Having bungee tie downs is especially nice if you are in rapid conditions and happen to roll your kayak over as they will stay secured onto your kayak and not fall into the water and get lost. If you like to fish, you will have a hard time finding this nice of a kayak for fishing purposes. In this design, there are actually four different rod holders, even though this is only a one person kayak. You will be able to cast in any direction that you please and be able to store your rod in the rod holder that best suits the direction you cast in. There is plenty of room on all sides of the kayak so that you can store fishing gear and with this design, you can even dip your feet in the water if you have been out fishing for a while and want to cool down. If you are looking to save some money and pick yourself up a budget kayak, you may want to find the best kayak under $400. This is a great kayak for under $300. The design is a single person sit on top design that actually has a lot of features even though the cost for the kayak is so low. The unit is extremely light weight and you have the option of picking up one or two of these at the checkout if you have the need for an additional water craft. k to your water access point. Portaging this kayak is a breeze and you shouldn’t have many problems getting it unstuck if you happen to come across a shoal or run the kayak aground. The only downside of having such a light weight design is that you may have a bit of a hard time going into rapid water conditions. Taking a kayak of this size into rapid conditions could definitely cause you to roll over. For this reason, you may definitely want to make sure you make use of the storage located in the design. Luckily, you will find that there is bungee storage so that you can even store larger gear if you need. Amazingly, even though this is such a low price tag, the manufacturer offers a five-year limited warranty with the kayak. You will be protected in the case of fading, cracking or peeling, which is awesome for the price and great for peace of mind with spending your money. If you are looking to get a kayak, you may want to try to find one that has a lot of room. This kayak offers just that. You will find that you have a ton of leg room in front of you. This is exactly what you should be looking for if you are looking for the best kayak for dogs. A sit-in kayak will allow your dog to get on and jump off as they please and you won’t have to be bothered as much by them being on your kayak with this much room in front of you. If you decide you want to bring pets along, it is ideal that this isn’t a very long design. You shouldn’t have too much of a problem attaching this kayak onto a roof rack or a trailer so that you can keep your pets in your vehicle and transport them safely to and from your water access location. Although you could just buy a super long kayak so that your pets can lay down, you will be able to easily reach your pets and control them if you choose to pick up one of these. The design has a pretty large dry storage compartment in its design, which will allow you to keep anything you need good and dry. The design has a very open top on it, which makes it extremely easy to be able to hop in and out of the kayak. You will love the fact that there are bungee straps throughout the kayak so that you can bring larger gear along with you if you desire. This design is just ten feet long, which is ideal in terms of being able to easily turn the unit. You should have no issues with tracking straight while using this canoe, which is great for people who are relatively new to kayaking. With the sit on top design, you should have no problems being able to paddle at fast speeds. There are a lot of benefits to getting a smaller kayak. By getting the best lightweight kayak, you will have a lot easier time with transportation and moving it by hand to your water access point. The other benefit of a light weight kayak design is that it is easier to get off of shoals and get back into the water when you are stuck. If you are looking for a kayak to use recreationally, you are going to like that there are a total of two different rod holders on this single person kayak. The design has an extremely comfortable seat on it, which has a back rest to offer your back lots of support throughout your day on the water. Having back support will help you be able to get more power behind your strokes and will likely result in you being able to traverse the river at a faster rate of speed. Taking a small kayak like this one into rapid water conditions is definitely possible. However, you may want to make sure that you know how to ekimo roll so that you can flip your kayak back up if you happen to roll over. This kayak does offer you a lot of edge control, but having too much maneuverability in rapid conditions can make for your kayak to become tippy. All it takes is one lean the wrong way and you will be in the water. Make sure you are prepared by storing your gear properly and tying down everything that needs it. You will love the fact that this kayak is very stable as a result of having chine rails in its design. There are also handles and a deep hull, which allow this kayak to track straight even when you are paddling fast. This is a kayak that has ample storage for all of your gear via cord straps and you will also find two different six-inch dry storage compartments, which you can use to keep things dry when you are out on the water. One of the best ways to shop for a kayak isn’t to look for a kayak that is at a certain price point, it is to look for a kayak that is the best value. To get the best value kayaks, you will need a ton of different features and a pretty good price tag. This kayak is a great example of value for your money. You can grab this unit in three different color options and it is a 12-foot design, which offers you speed and versatility out on the water. This kayak is very stable and you will find that it tracks quite straight in the water. The design has lots of extra storage in it, which can be used to hold all of your kayaking gear. This is a perfect kayak for recreational use as a result of a comfortable seat and fishing holders being incorporated into the design. Although you will be sitting lower in the water with a sit in kayak design, you are close enough that you won’t have to worry about catching your rod on your kayak when reeling. The sit in unit does not allow for a ton of seating options, but it does help to keep you dry out on the water. If you like to sit cross-legged or in other positions, you may not like this design. The cockpit is big enough to sit comfortably in with footpegs and thigh braces along with a large bulkhead. However, the sit-in kayak design does have a padded back and a padded cushion to sit on to help keep you comfortable, which is great for the lower price tag of this kayak. You should be able to generate quite a bit of power when doing forward and backward strokes, which will help you to be able to get from location to location faster. The great thing about a sit in kayak design is that you don’t notice waves as much when you are using the kayak. Instead of hitting rapid conditions and having them come right over the top of the kayak, you will find that the water just hits the side and slides off. Unfortunately, if you happen to hit a huge wave, you may find that water gets stuck inside of the kayak and you will have to do a wet exit by rolling, which is one downfall of the design. You are going to be a huge fan of how light this design is and how easy it is to get to your access point. The kayak has comfortable retractable handles, which makes it very easy to carry. The kayak weighs just 47 lbs when shipped, which is extremely low for how long the unit is. 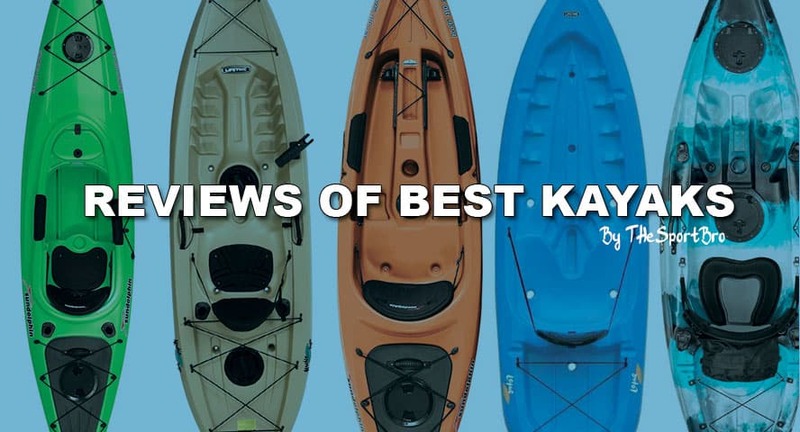 We hope that our article portraying the best kayaks of 2018f has been helpful to you in being able to pick out and see some of the great kayak options that are available in the marketplace. Always remember to make sure that you take a look at a bunch of options before making a decision and do your research to find out what features and options are the best to suit your needs. We wish you luck in picking out and searching for a new kayak and we hope that our list has assisted you in finding one.